Breakout alert! EUR/USD is lollygagging along an ascending triangle on the 1-hour chart, with the 1.0950 minor psychological level serving as resistance. 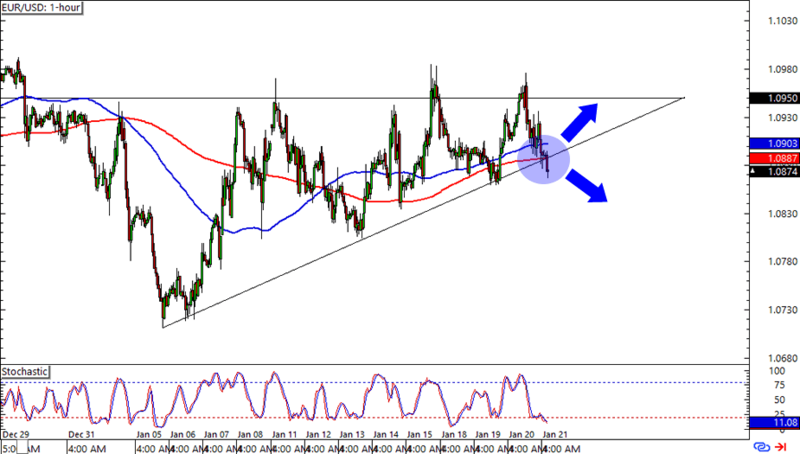 Right now the pair is around the 1.0875 zone, which is right smack at the rising trend line and 100 and 200 SMA areas. Will the bulls step in, or will the bears push for a downside break today? After all, the School of Pipsology says that an ascending triangle doesn’t always have to break to the upside. A long trade at current levels with stops below the trend line could get you a decent trade if you think that the euro isn’t done gaining on the dollar. On the other hand, you could wait for a break below the triangle if you’re one of them euro bears. Loonie bears huddle up! After finding resistance at the 1.4650 levels, USD/CAD has leveled off a bit and is now trading at the 1.4450 areas. Interestingly, the pair is approaching a potential support level with the 200 SMA and previous support and resistance waiting just below current prices. Not only that, but Stochastic is also flashing an oversold signal. 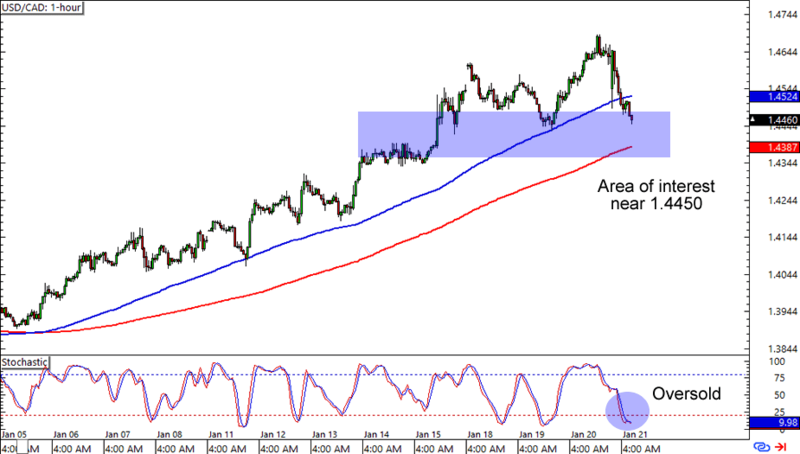 Think USD/CAD is in for more gains? A long trade just above the 200 SMA is a good idea if you believe that the pair would shoot back up to its previous highs. Gotta make them stop losses loose though, as we could also be seeing a double top in the making. Here’s another trend trade for ya! 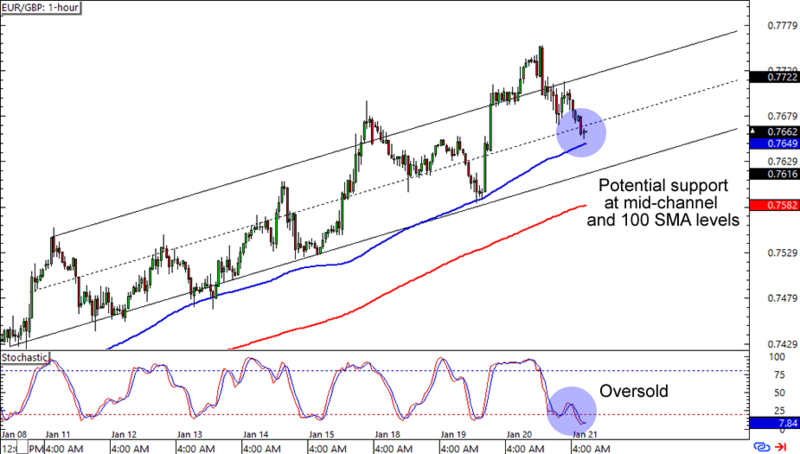 EUR/GBP is testing the .7660 levels, which lines up with a mid-channel line and the 100 SMA on the 1-hour chart. Stochastic is also currently on the bulls’ side with an oversold signal. You could buy at current levels if you’re an aggressive bull, but you could also wait for a retest of the channel support or at least a couple of reversal candlesticks at current levels if you’re not too sure that the pair would pop up anytime soon.